The vineyards on the Luxembourg banks of the river Moselle are still covered in mist when the harvest activities commence in the early hours of the morning. A recurring process which takes place every year during the months of September and October. The vineyards are those of Domaines Vinsmoselle and cover 850 acres of land. The Vinsmoselle cooperative was founded in 1921 and nowadays includes the wine cellars of Greiveldange, Grevenmacher, Remerschen, Stadtbredimus, Wellenstein and Wormeldange. This makes them the largest producer of wine and sparkling wine- crémant - in Luxembourg with a range of over 300 quality wines. In between the vines, the pickers are manually selecting and collecting grapes. A job that is carried out with the utmost care and precision. The soil in which the vines are planted, contributes to the specific, rich flavour of the grapes. Picking the grapes by hand ensures the quality of the harvest. When full, the picker's bucket is emptied into a Dolav box pallet that is ready and waiting by the side of the road. Roadside collection of harvested grapes in Dolavs. When Domaines Vinsmoselle set out to automate their harvest processing facility 20 years ago, the cooperative went looking for a plastic box pallet that would fit seamlessly into the process of harvest collection and wine making. A box, moreover, that needed to meet the strict hygienic requirements that are applicable for the production of wine. 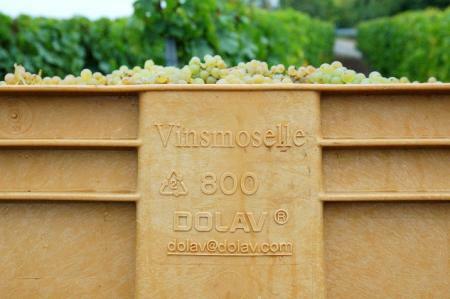 The winery found their partner in DOLAV® Plastic Products. DOLAV® has over 30 years of experience with the production and delivery of large volume, heavy duty box pallets, among others to the food industry. Dolavs are the only boxes in the market place that are manufactured in food-grade HDPE using one-piece injection moulding. Domaines Vinsmoselle opted for the solid version of the Dolav type 800 box pallet because its dimensions (1200x800x740 mm), volume (500 l) and load capacity(700 kg) integrate effortlessly in their automated processing line. Apart from that, Dolavs are specifically suited for stacked storage and handling and tipping with forklifts. Furthermore, they are UV-resistant, which is, of course, very important considering the intensive outdoor use. Lastly, the boxes were customised following Domaine Vinsmoselle's wishes by branding them with an embossed logo and producing them in a special colour. Dolavs with grapes ready for processing. 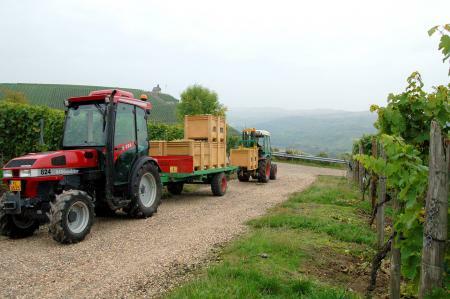 At the winery's collecting station, tractors drive back and forth to deliver their trailers which are full of Dolavs filled up to the brim with grapes. The boxes are offloaded from the trailers by forklifts and placed onto the automated processing line. Before the Dolavs are lead through the processing line to be tipped and emptied, a sample is taken from the grapes to test their quality. Only after the sample has been checked and approved by the lab, the box continues on. Directly after emptying, the Dolavs are cleaned in the automated washing facility and subsequently stacked for future use. During the harvesting period, approximately 2600 Dolavs are in continuous circulation. They are still in tiptop shape, considering they have been in use for 20 years now. Therefore, one can truly say that Dolavs are hygienic, durable, high quality boxes that meet the strict standards and regulations that are applicable in both the Grand Duchy of Luxembourg as well as the European. Guido Sonntag, chef caviste Crémant Poll Fabaire, Domaines Vinsmoselle, said: "It really is extraordinary. In the 20 years that we have been using Dolavs, only a handful of boxes needed repairing. Considering the fact that we use them intensively, this is remarkable. Dolavs fit excellently in all stages of our production process, whether it is during transportation, handling, cleaning or storage. They can easily handle the most demanding of circumstances. DOLAV® pallet boxes are a valuable addition to our organisation's production process.